Have you ever thought of traveling to Pamplona for the traditional bull run? Now you can feel the excitement of the Pamplona Bull Run without by simply playing the 1024 Ways to Win Pamplona slot machine from IGT, here free at Slotorama! The bull run is celebrated in Irunea/Pamplona each year for the fiestas of San Fermin where the bull are lead through every day streets of the old quarter by bull ring runners. Live the moment through slots play with Pamplona slot machine and be ready for excitement! The slot is set in an arena and the music playing in the background will bring you deep into Spanish culture. On the reels you’ll find many themed and colorful symbols ready for you to create winning combinations from. You’ll find the Matador’s red cape, the Matador himself, a Bull up close, a bull profile as the scatter, flowers, traditional card symbols 9 through ace and much more. 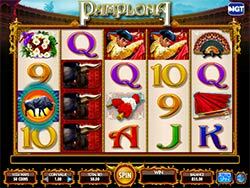 MultiWay Xtra – The MultiWay Xtra feature in Pamplona gives you 1024 different ways to win, instead of the traditional number of lines you find in other slots. Earn symbol wins for same symbol in any position on adjacent reels beginning with the leftmost reel. Matador Wilds – The Matador is the Wild symbol and he will substitute for all other symbols except the bull which is the scatter symbol. If one or more Matadors subtitute in a win, the pay is also double for that win! These symbols can appear from reels 2 through 5. El Toro Bonus – Land three or more Bull symbols on the board in any position to win the El Toro Bonus round. In this round you’ll get to choose from different free spin amounts with multipliers. Choose 5 free spins with a 20x multiplier, 10 free spins with a 15x multiplier, 15 free spins with a 10x multiplier, 20 free spins with a 5x multiplier or 30 free spins with a 3x multiplier! The El Toro Bonus can also be retriggered during free spins.